For other uses, see New Yorker (disambiguation). Not to be confused with New York (magazine). The New Yorker is an American magazine featuring journalism, commentary, criticism, essays, fiction, satire, cartoons, and poetry. It is published by Condé Nast. Started as a weekly in 1925, the magazine is now published 47 times annually, with five of these issues covering two-week spans. [T]he limiting factor [in literature] is the reader. No other art requires the audience to be a performer. You have to count on the reader's being a good performer, and you may write music which he absolutely can't perform—in which case it's a bust. Those writers you mentioned and myself are teaching an audience how to play this kind of music in their heads. It's a learning process, and The New Yorker has been a very good institution of the sort needed. They have a captive audience, and they come out every week, and people finally catch on to Barthelme, for instance, and are able to perform that sort of thing in their heads and enjoy it. The non-fiction feature articles (which usually make up the bulk of the magazine's content) cover an eclectic array of topics. Recent[when?] subjects have included eccentric evangelist Creflo Dollar, the different ways in which humans perceive the passage of time, and Münchausen syndrome by proxy. Ross was succeeded as editor by William Shawn (1951–87), followed by Robert Gottlieb (1987–92) and Tina Brown (1992–98). Among the important nonfiction authors who began writing for the magazine during Shawn's editorship were Dwight Macdonald, Kenneth Tynan, and Hannah Arendt; to a certain extent all three authors were controversial, Arendt the most obviously so[according to whom?] (her Eichmann in Jerusalem reportage appeared in the magazine before it was published as a book), but in each case Shawn proved an active champion. The New Yorker influenced a number of similar magazines including The Brooklynite (1926 to 1930), The Chicagoan (1926 to 1935) and Paris's The Boulevardier (1927 to 1932). The New Yorker has been the source of a number of movies. Both fiction and non-fiction pieces have been adapted for the big screen, including Flash of Genius (2008), based on a true account of the invention of the intermittent windshield wiper by John Seabrook; Away From Her, adapted from Alice Munro's short story "The Bear Came over the Mountain", which debuted at the 2007 Sundance Film Festival; The Namesake (2007), similarly based on Jhumpa Lahiri's novel, which originated as a short story in the magazine; The Bridge (2006), based on Tad Friend's 2003 non-fiction piece "Jumpers"; Brokeback Mountain (2005), an adaptation of the short story by Annie Proulx that first appeared in the October 13, 1997, issue of The New Yorker; Jonathan Safran Foer's 2001 debut in The New Yorker, which later came to theaters in Liev Schreiber's debut as both screenwriter and director, Everything Is Illuminated (2005); Michael Cunningham's The Hours, which appeared in the pages of The New Yorker before becoming the film that garnered the 2002 Best Actress Academy Award for Nicole Kidman; Adaptation (2002), which Charlie Kaufman based on Susan Orlean's The Orchid Thief, written for The New Yorker; Frank McCourt's Angela's Ashes, which also appeared, in part, in The New Yorker in 1996 before its film adaptation was released in 1999; The Addams Family (1991) and its sequel, Addams Family Values (1993), both inspired by the work of famed New Yorker cartoonist Charles Addams; Brian De Palma's Casualties of War (1989), which began as a New Yorker article by Daniel Lang; Boys Don't Cry (1999), starring Hilary Swank, began as an article in the magazine, and Iris (2001), about the life of Iris Murdoch and John Bayley, the article written by John Bayley for The New Yorker, before he completed his full memoir, the film starring Judi Dench and Jim Broadbent; The Swimmer (1968), starring Burt Lancaster, based on a John Cheever short story from The New Yorker; In Cold Blood (1967), the widely nominated adaptation of the 1965 non-fiction serial written for The New Yorker by Truman Capote; Pal Joey (1957), based on a series of stories by John O'Hara; Mister 880 (1950), starring Edmund Gwenn, based on a story by longtime editor St. Clair McKelway; The Secret Life of Walter Mitty (1947), which began as a story by longtime New Yorker contributor James Thurber; and Meet Me in St. Louis (1944), adapted from Sally Benson's short stories. According to Pew Research, 77 percent of The New Yorker's audience hold left-of-center political values, while 52 percent of those readers hold "consistently liberal" political values. Many New Yorker readers saw the image as a lampoon of "The Politics of Fear", as was its title. Some of Obama's supporters as well as his presumptive Republican opponent, Sen. John McCain, accused the magazine of publishing an incendiary cartoon whose irony could be lost on some readers. However, editor David Remnick felt the image's obvious excesses rebuffed the concern that it could be misunderstood, even by those unfamiliar with the magazine. "The intent of the cover", he said, "is to satirize the vicious and racist attacks and rumors and misconceptions about the Obamas that have been floating around in the blogosphere and are reflected in public opinion polls. What we set out to do was to throw all these images together, which are all over the top and to shine a kind of harsh light on them, to satirize them." In an interview on Larry King Live shortly after the magazine issue began circulating, Obama said, "Well, I know it was The New Yorker's attempt at satire... I don't think they were entirely successful with it". But Obama also pointed to his own efforts to debunk the allegations portrayed in The New Yorker cover through a web site his campaign set up, stating that the allegations were "actually an insult against Muslim-Americans". The New Yorker chose an image of Bert and Ernie by artist Jack Hunter, entitled 'Moment of Joy', as the cover of their July 8, 2013 publication, which covers the Supreme Court decisions on the Defense of Marriage Act and California Proposition 8. The Sesame Street characters have long been rumored in popular culture and urban legend to be homosexual partners, though Sesame Workshop has repeatedly denied this, saying they are merely "puppets" and have no sexual orientation. Reaction was mixed. Online magazine Slate criticized the cover, which shows Ernie leaning on Bert's shoulder as they watch a television with the Supreme Court justices on the screen, saying "it's a terrible way to commemorate a major civil-rights victory for gay and lesbian couples." The Huffington Post, meanwhile, said it was "one of [the magazine's] most awesome covers of all time". 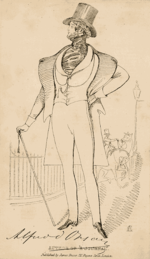 ^ The caricature, or a variation of it, appeared on the cover of every anniversary issue until 2017, when, in protest of Executive Order 13769, Tilley wasn't depicted (although a variation appeared two issues later). ^ "The New Yorker February 13 & 20, 2017 Issue". The New Yorker. Retrieved March 12, 2018. ^ "The New Yorker March 6, 2017 Issue". The New Yorker. Retrieved March 12, 2018. ^ "The New Yorker media kit". condenast.com. Archived from the original on October 21, 2014. ^ "eCirc for Consumer Magazines". Alliance for Audited Media. June 30, 2018. Retrieved January 4, 2019. ^ Temple, Emily. "20 Iconic New Yorker Covers from the Last 93 Years". Literary Hub. Retrieved February 23, 2018. ^ Norris, Mary (May 10, 2015). "How I proofread my way to Philip Roth's heart". The Guardian. Retrieved July 12, 2018. It has been more than 20 years since I became a page OK'er—a position that exists only at the New Yorker, where you query-proofread pieces and manage them, with the editor, the author, a fact-checker, and a second proofreader, until they go to press. ^ Dubuque Journal; The Slight That Years, All 75, Can't Erase, Dirk Johnson, The New York Times, August 5, 1999. ^ Franklin, Ruth (June 25, 2013). "'The Lottery' Letters". www.newyorker.com. Condé Nast. Retrieved June 11, 2018. ^ Vonnegut, Kurt (1988). Allen, William Rodney, ed. Conversations with Kurt Vonnegut. Jackson, MI: University Press of Mississippi. pp. 163–164. ISBN 9780878053575. ^ Easley, Greg (October 1995). "The New Yorker: When a Magazine Wins Awards But Loses Money, the Only Success is the Editor's Private One". Spy. Retrieved July 31, 2015. ^ Mahon, Gigi (September 10, 1989). "S.I. Newhouse and Conde Nast; Taking Off The White Gloves". ^ Tom Wolfe, "Foreword: Murderous Gutter Journalism," in Hooking Up. New York: Farrar Straus Giroux, 2000. ^ Rosenblum, Joseph (2001). "About Town". In Wilson, John D.; Steven G. Kellman. Magill's Literary Annual 2001: Essay-Reviews of 200 Outstanding Books Published in the United States During 2000. Pasadena, Calif.: Salem Press. p. 5. ISBN 0-89356-275-0. ^ Yagoda, Ben (2001). About Town: The New Yorker and the World It Made. Da Capo Press. pp. 202–3. ISBN 978-0-306-81023-7. ^ Carmody, Deidre. "Despite Malcolm Trial, Editors Elsewhere Vouch for Accuracy of Their Work." The New York Times. May 30, 1993. ^ Craig Silverman: Inside the World's Largest Fact Checking Operation. A conversation with two staffers at Der Spiegel Columbia Journalism Review, April 9, 2010. ^ Julia Filip, "Art Analyst Sues The New Yorker" Courthouse News Service (July 1, 2011). ^ Dylan Byers, "Forensic Art Expert Sues New Yorker – Author Wants $2 million for defamation over David Grann piece", Adweek, June 30, 2011. ^ Samaha, Albert (August 5, 2013). "Art Authenticator Loses Defamation Suit Against the New Yorker". Village Voice blog. ^ "The Talk of the Town" (October 29 and November 5, 2012). ^ "The New Yorker Endorses Hillary Clinton". The New Yorker. Retrieved November 17, 2016. ^ Lee, Judith Yaross (2000). Defining New Yorker Humor. Univ. Press of Mississippi. ISBN 9781578061983. ^ Overbey, Erin (January 31, 2013). "A New Yorker for Brooklynites". ISSN 0028-792X. Retrieved January 27, 2019. ^ "ERSKINE GWYNNE, 49, WROTE BOOK ON PARIS". timesmachine.nytimes.com. May 6, 1948. Retrieved January 27, 2019. ^ "Lee Lorenz". The New Yorker. Retrieved July 31, 2015. ^ Cavna, Michael. "Bob Mankoff named humor editor for Esquire one day after exiting the New Yorker," Washington Post (May 1, 2017). ^ Gill, Brendan. Here at The New Yorker. New York: Berkley Medallion Press, 1976. p. 341. ^ Gill (1976), p. 220. ^ "Michael Maslin – Finding Arno". ^ "CBR.com – The World's Top Destination For Comic, Movie & TV news". ^ Fleishman, Glenn (December 14, 2000). "Cartoon Captures Spirit of the Internet". The New York Times. Archived from the original on April 16, 2009. Retrieved October 1, 2007. ^ Peter Steiner's "On the Internet, nobody knows you're a dog." ^ "Caption Contest Rules". The New Yorker. Retrieved July 12, 2018. ^ Gopnik, Adam (February 9, 2009). "Postscript". The New Yorker: 35. ^ Norris, Mary. "The Curse of the Diaeresis". The New Yorker. Retrieved April 18, 2014. ^ Stillman, Sarah. "The Throwaways". The New Yorker. Retrieved April 18, 2014. ^ Norris, Mary. "The Double L". The New Yorker. Retrieved March 10, 2016. ^ Norris, Mary. "In Defense of 'Nutty' Commas". The New Yorker. Retrieved March 10, 2016. ^ Davidson, Amy. "Hillary Clinton Says 'No'". The New Yorker. Retrieved April 18, 2014. ^ "Where New Yorker's Audience Fits on the Political Spectrum". Pew Research Center's Journalism Project. October 21, 2014. Retrieved April 1, 2018. ^ "Eustace Tilley". March 29, 2010. ^ Kunkel, Thomas (June 1996). Genius in Disguise. Carroll & Graf Publishers. p. 512. ^ Mouly, Françoise (February 16, 2015). "Cover Story: Nine for Ninety". The New Yorker. Retrieved July 31, 2015. ^ "The New Yorker Cover, View of the World from 9th Avenue – March 29, 1976 Poster Print by Saul Steinberg at the Condé Nast Collection". ^ "New Yorker Cover – 10/6/2008 at The New Yorker Store". Newyorkerstore.com. October 6, 2008. Retrieved October 15, 2010. ^ "Issue Cover for March 21, 2009". Economist.com. March 21, 2009. Retrieved August 26, 2012. ^ "ASME's Top 40 Magazine Covers of the Last 40 Years – ASME". ^ "The New Yorker uncovers an unexpected profit center – Ancillary Profits – by licensing cover illustrations". Folio: The Magazine for Magazine Management. Highbeam.com. February 2002. Archived from the original on 2016-05-04. ^ Daniel Grand (February 12, 2004). "A Print by Any Other Name..." OpinionJournal. ^ Campbell, James (August 28, 2004). "Drawing pains". The Guardian. London. Retrieved May 25, 2010. ^ Chideya, Farai (July 15, 2008). "Cartoonist Speaks His Mind on Obama Cover: News & Views". NPR. Retrieved October 15, 2010. ^ Shapiro, Edward S. (2006). Crown Heights: Blacks, Jews, and the 1991 Brooklyn Riot. UPNE. p. 211. ^ Jack Salzman; Cornel West (1997). Struggles in the Promised Land: Towards a History of Black-Jewish Relations in the United States. Oxford University Press US. p. 373. ISBN 978-0-19-508828-1. Retrieved February 24, 2011. ^ The Associated Press (July 14, 2008). "New Yorker cover stirs controversy". Canoe.ca. Archived from the original on July 31, 2008. ^ "Was it satire?". The Hamilton Spectator. July 19, 2008. Retrieved February 24, 2011. ^ "Barack Obama New Yorker Cover Branded Tasteless". Marie Claire. July 15, 2008. Retrieved February 24, 2011. ^ Jake Tapper (July 14, 2008). "New Yorker Editor David Remnick Talks to ABC News About Cover Controversy". ABC News. Retrieved February 24, 2011. ^ "Democrats' bus heads South to sign up new voters". The Boston Globe. July 16, 2008. Retrieved February 24, 2011. ^ Jake Tapper (July 13, 2008). 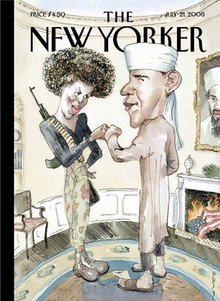 "Obama Camp Hammers New 'Ironic' New Yorker Cover Depicting Conspiracists' Nightmare of Real Obamas". Political Punch. ABC News. Retrieved February 24, 2011. ^ "Obama Cartoon", The Daily Show, July 15, 2008. ^ Josh Wolk (September 30, 2008). "Entertainment Weekly October 3, 2008, Issue #1014 cover". Entertainment Weekly. Archived from the original on April 27, 2009. Retrieved February 24, 2011. ^ Beam, Christopher (July 14, 2008). "The 'Terrorist Fist Jab' and Me". Slate. Archived from the original on December 27, 2009. Retrieved January 23, 2010. ^ "Fox News anchor calls the Obamas' fist pound 'a terrorist fist jab'". Think Progress. Retrieved June 10, 2008. ^ "Fox News Changes: 'Terrorist Fist Jab' Anchor E.D. Hill Loses Her Show, Laura Ingraham In At 5PM", Huffington Post, June 18, 2008. ^ Christina Ng. "Bert and Ernie Cuddle Over Supreme Court Ruling". ABC News. Retrieved June 28, 2013. ^ Caryn James (May 13, 2001). "Neighborhood Report: CRITIC'S VIEW; How The New Yorker Took Wing In Its Larval Years With Ross". The New York Times. Retrieved February 24, 2011. ^ Quick Vids by Gary Handman, American Libraries, May 2006. Boxer, Sarah. "A Gaggle of Cartoonists", The New York Times, February 14, 2000. "How to Submit Cartoons to The New Yorker"